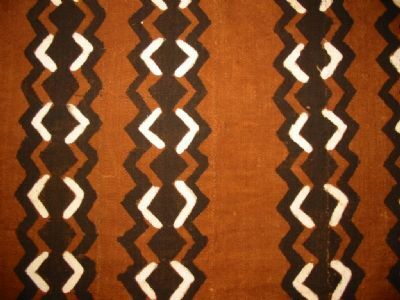 So, when I was raiding my mother’s closet I came across a textile that (to a fairly novice person like me) looked like a modern Malian mud cloth (Bògòlanfini) – the black, white and rust colours are popular to mud cloth; the zig-zag pattern seemed familiar to mud cloth; the designs were painted onto the fabric also like mud cloth. But to my surprise my mother revealed this to be a Sierra Leone textile which she got as a gift in 1996/97 from some friends in Freetown. Sierra Leone textile – dyes produced from kola nuts and brown leaves. Unlike mud cloth which gets its colour and design through a process known as ‘discharge’ dye (pretty much the opposite of resist dyeing), this Sierra Leone cloth used dyes based on kola nuts and brown leaves! 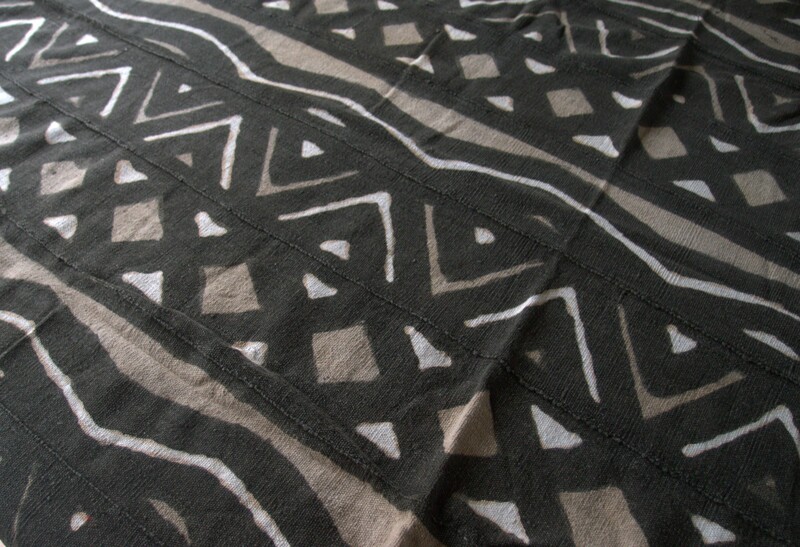 Mud cloth from Mali. Colour is gained through a process known as ‘discharge’ dye – the cloth is first dyed yellow by dipping it in a plant-based solution and drying it in the sun. River mud is then painted onto the cloth, outlining the designs/motifs, this mud reacts with the dyed cloth and upon removing the mud, these areas remain brown/black. A caustic solution is then used on the unpainted areas of the cloth, removing the yellow colour and rendering them white. The darkness of the design outline is dependent on the number of times you retrace the outline with mud. Image from Wikipedia. Kola nut (Cola nitida), a nut widely traded throughout West Africa and chewed as a stimulant is used to produce orange/brown colours in many West African textiles. (A bit of trivia for you – the cola nitida nut was also exported to Britain in the 1890s and later America where it became one of the key ingredients in “Coca-Cola” – it is now no longer used in “Coca-Cola” drinks). The Sierra Leone textile of my mother’s is a type of country cloth that was woven on a narrow loom. I am not too sure how common it is to paint designs on after the cloth has been woven, when I was searching around on the internet most examples of Sierra Leone country cloth I seemed to find got their design during the weaving process – different coloured cotton threads was used to give rise to the various designs. If any of you know, please let me know as I’d love to find out! It seems Sierra Leone has a proud history of its country cloth as it was a key feature of its pavilion at the 1924 British Empire Exhibition. A postcard showing the pavilion can be found here.